This is a recipe that I use often as an ingredient in recipes such as Morning Glory Muffins. It's quick to make and freezes well. I like to freeze it in small quantities already scaled out for a favorite recipe. Slice whole peeled and cored pineapple into crosswise slices ¼" thick. Cut the pineapple rings into ¼" wedges. 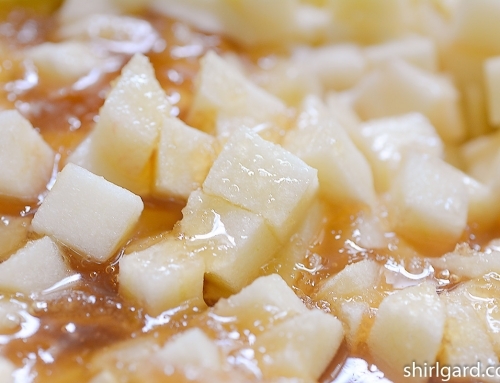 Place pineapple chunks and sugar in a sauce pan. Bring to a boil, stirring constantly, and cook for 5 minutes. Let cool at room temperature or over an ice bath. Drain before using in a recipe. Use right away, refrigerate for 1 week, or scale into desired portions and freeze for longer storage. Sugar content = 25% of pineapple / 20% of total recipe. I first used this preparation as an ingredient in Gelato, a version which uses more sugar to prevent the pineapple from being icy. I created this version with less sugar so that it could be used in baked goods. The Gelato version of Pineapple Compote was adapted from Luciano Ferrari's book: Gelato & Gourmet Frozen Desserts - A Professional Learning Guide (2005).